Our office focuses on a variety of chiropractic techniques to assist us in getting our patients well. 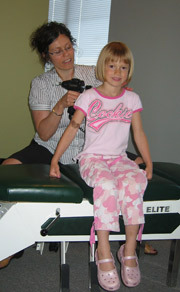 Our Halifax chiropractic office offers a unique, breakthrough approach to patient care by using a specific adjusting technique called the Koren Specific Technique (KST) to assist us in getting our patients well. There is no twisting, turning, “cracking” or “popping” of joints with KST. This is a very gentle, low force style of adjusting the spine that allows us to make very specific and gentle corrections to your spine and structural system. Many adjustments can even be done with you standing or sitting. This is one of the main advantages of KST. It allows the doctor to analyze and adjust patients in different postures and positions. This may include a lying down, standing, sitting posture, and/or a posture that is in the position of dysfunction/subluxation. This is an important concept because often times a patient’s dysfunction/subluxation may only present itself in these altered positions. How should I feel after a KST adjustment? Everyone is different, but many of our patients report a sense of ease, relaxation and well-being as their nervous system begins to respond to the changes we are making. Many of our patients report a lessening of their original symptoms in as early as their first visit. Others require a little more time to see a change. However, many often report a “lighter feeling”, the ability to breather more deeply and relax more easily. Others report experiencing an improved quality of sleep. No matter what your experience to your first adjustment, we will help guide you to a greater understanding of your body and the healing process and assist each of our patients in experiencing a body free the negative side effects of subluxation (nerve stress). Don’t wait! Have a chiropractic check-up today! Click here to learn more about KST, then give our Halifax chiropractic office a call if you have any questions! We look forward to hearing from you!